A&A Moving Company strives to deliver the highest level of quality service amongst Los Angeles residential movers, and we are ready to handle any sized move professionally and competently. We have been in business since 1966 and have the experience needed to make your move as stress free as possible. If you need assistance moving out of your old home and into your new one, call the expert movers in Los Angeles, contact A&A Moving Company at (800) 349-5000. As local Los Angeles Residential Movers, we have been committed to bringing the highest level of customer service to our customers in Los Angeles, Orange, Ventura and San Bernardino Counties for the last 10 years. We are a professional moving company committed to the neighborhoods we serve and live in. We are licensed, fully insured and bonded as Los Angeles Residential Movers. It is our goal to provide you with the highest level of dependable and efficient service during your move. Our employees are trained to treat your furniture and valuable items with extra care when packing, to ensure their safe arrival. Your belongings will be shrink-wrapped for extra protection and our movers will disassemble your furniture and wrap each piece separately for maximum protection during transportation. We are so committed to guaranteeing the safety of your belongings that we include basic cargo insurance in the quoted price for your move. We offer packing services and use a wide range of moving supplies to meet our goals of efficiency and safety. Packing boxes designed specifically for the moving of dishes, wardrobe items and pictures are just a few examples of these. Our packing methods are all designed to provide maximum protection of your valuable belongings during the move. Many moving companies require notice and may have trouble fitting your move into their schedule. We pride ourselves in being efficient and flexible, and meeting last minute moving needs are not a problem for us. You can contact us at any time of the day or night to schedule a move. 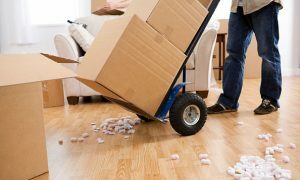 Unlike other moving companies, there are no surprise charges at the end of the move. We do not charge sales tax for labor, services or products, and we do not include an additional fee for millage if the move is within thirty miles. There is no extra charge for moving items from an apartment up or down stairs or for the use of elevators. We also do not charge for any moving equipment that may be used such as dollies, tool rental charges or moving pads. The use of wardrobe boxes on the day of the move is also free. We charge a reasonable hourly rate of $30 an hour per man for our services. Your bill will include the time spent packing, driving your belongings to their destination, and the unloading of your belongings. This means that you will only be charged for the time spent working, until the completion of the job. MasterCard and Visa are accepted for the customers’ convenience. We are ready to help you 24 hours a day, 7 days a week. To schedule a move, get a free quote or for more information, contact A and A Moving in Los Angeles Ca at (800) 349-5000.